Darlovelo are offering the chance of half price hire charges if bookings are made with a friend or relative. 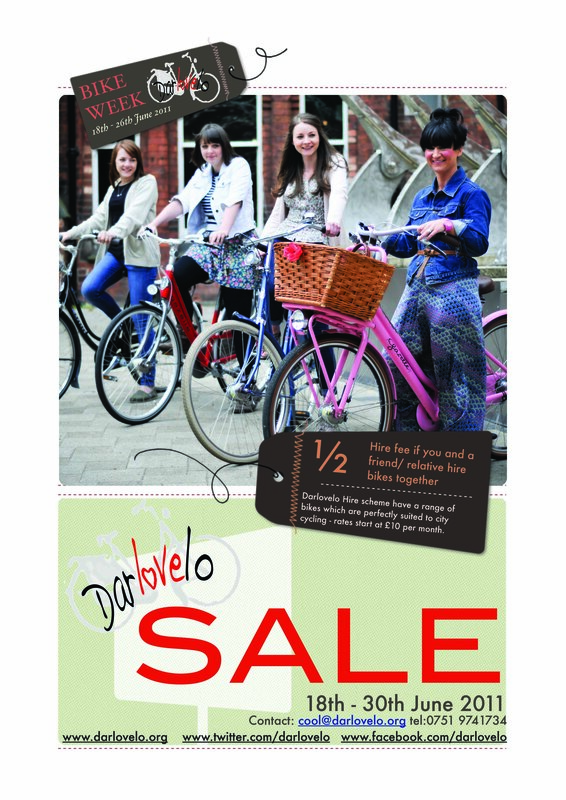 The offer coincides with national bike week 18th – 26th June 2011 which helps to promote cycling across the UK. It is a great opportunity to introduce non cyclist to the joys of being on a bike or help people who want to cycle but want someone to share the experience with. Darovelo would love more people to think about cycling as an everyday activity which can be enjoyed with friends. High quality, dedicated infrastructure will be required if Britain is to become a mass-cycling country, according to new research. Academics from Lancaster University, the University of Leeds and Oxford Brookes University have just released the results of a three year in-depth study of cycling in four English towns (Lancaster, Leeds, Leicester and Worcester). The work is funded by the Engineering and Physical Sciences Research Council (EPSRC). Key findings are summarised on the Bike Hub blog. In the second cycling culture, predominantly amongst less affluent working class communities, the bicycle is simply seen as irrelevant to transport, a child’s toy. Here, the bicycle is used more as a second-rate substitute for a car due to lack of affordability of the latter. As Dr. Horton writes, “although people from these communities tend not to rate cycling very highly, some do nontheless ride, through necessity, and on the footway. They ride on footways for two main reasons: first, because they feel safer there; and second, in order to stay out of the way of cars, which they don’t want to delay”. “We need radically to restructure our urban mobility systems in ways which will get people out of their cars and make them cycle. Half of the infrastructural change required is underway – the push for a maximum speed limit of 20 mph on residential streets is gaining momentum. But the other half of the key infrastructural change required needs a similar push, and this push should be for very high quality and continuous segregated cycling infrastructure on our biggest and busiest urban roads, the kind of roads on which almost everyone today refuses to cycle”. The emphasis on infrastructure is made because of successive government and local authority decisions to support some of the easier requirements for a mass cycling culture – improved cycle parking, cycle training, bicycle coops and shops, promotional events and activities, bike hire. And 20’s Plenty campaigns around the country (including in our own Darlington) are gradually succeeding in moving local authorities to accept 20mph as the default speed limit in residential streets. But the key need to address the quality of the cycling experience on busy main roads is consistently avoided, for fear of offending “the motorist”. With endless technical examples of best practice available from countries like the Netherlands, the problem is clearly political. Yet even in this sphere, inspiring examples of successful political action to radically transform cities, such as Seville in Spain, can be found. But in the end, it may well be down to who our politicians listen to, rather than any technical expertise or ideas of best practice. 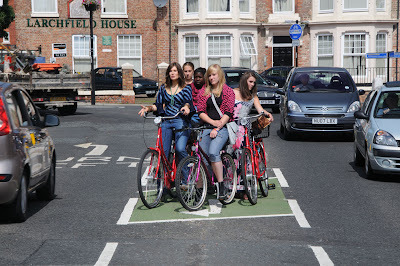 One positive sign is that cycling’s national organisations appear to be slowly coming round to the same conclusions of Beauty and the Bike, the EPSRC, and an increasing number of cycling campaigns around the country. Whether UK politicians take any notice, though, is another matter.